Nourished by Taiwan’s free creative en­viron­ment, Mario has not only demonstrated his talent at sand art, but also applied his boundless creativity to painting and clothing design. As well as becoming a focal point for friendship among Filipino com­pat­riots in Taiwan, he has given back to poor children in his hometown. With a wife who is his partner in both business and life, Mario is grateful that his home is in Taiwan. “This has been a completely unexpected life.” As the youngest child of a loving family, Mario was pampered by his parents and elder siblings, who put a lot of energy into raising and educating him. But when his father, who was in politics, suffered a sudden illness, the family abruptly lost its means of support. “This was the time for me to repay my parents.” In 2011 Mario came alone to Taiwan and entered a high-tech company in Hsin­chu as a low-level shift worker. “I lived in the migrant workers’ dormitory, and each day I went out early and returned late.” Strictly managed and passing monoton­ous days with machine-like regularity, all he could do was numb himself with his profound exhaustion. Memories were the only antidote to raise his spirits. “When I was small my sister taught me to paint.” Looking back on the happy times of childhood lifted Mario’s depression somewhat. Unconsciously he began to use odds and ends around him to do some casual painting. 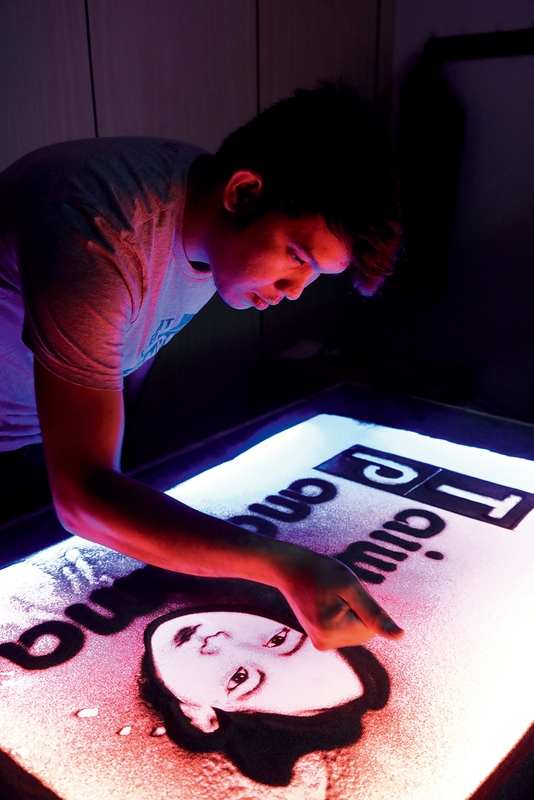 “I was really amazed when I saw other people doing sand art performances.” In the hands of an artist, a tray of sand can go through endless seemingly magical transformations in an instant. It was this inspiration that launched Mario’s dazzling new life. “I learned by watching videos on YouTube.” He groped his own way forward and taught himself without a teacher. Countless times he would work through the night trying to master this art form. His most frequent subject-­matter was the faces of his parents and family members. Although his hands became coarse and cracked from the grains of sand, and his eyes grew sore and sensitive from the fluorescent light beneath the glass panel of the lightbox on which he worked, Mario’s determination to follow his dream gave him inexhaustible resolve. To enable more people to see sand painting perform­ances, Mario plucked up his courage and entered the street artist selection process. In 2015, he became the first foreign migrant laborer in Taiwan to be licensed as a street artist, in his case in Tai­pei City as well as Hsin­chu city and county. After his first appearance on television, Mario could not contain his excitement and immediately called home. “My father, who had suffered a stroke many years previ­ously and was unable to talk, kept happily shouting out ‘Ah! Ah!’” People were amazed by the live sand art performances, with their animation-like effect and backlit colors. Mario’s greatest strength lies in the realism of his images. Be it portraits, buildings, text or logos, clients are invariably impressed by the lifelike images. Besides doing charity and commercial performances, Mario has even been invited by the Manila Economic and Cultural Office in Taipei to do a sand art perform­ance at a Philip­pines state banquet. As well as doing sand art, Mario has also taken up mixed-media painting and begun to design clothes and arrange fashion shows. As a migrant-worker artist, Mario’s prime concern is to do something for his compatriots, to enable Taiwanese to see their talents. 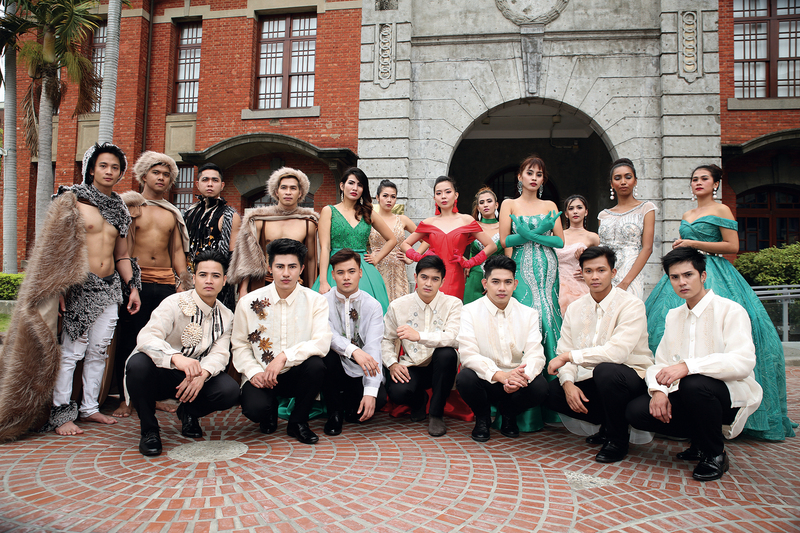 “For my first performance I was invited to take part in a flash mob in Xi­men­ding.” Besides using colored sand to do paintings on the spot, Mario also designed an eco-fashion show for Filipino migrant-worker models, with creative clothing made from recycled materials. Having garnered attention with his first shot, Mario got the notion to form an arts troupe, named Aface, for Filipino migrant workers, to put on charity performances. 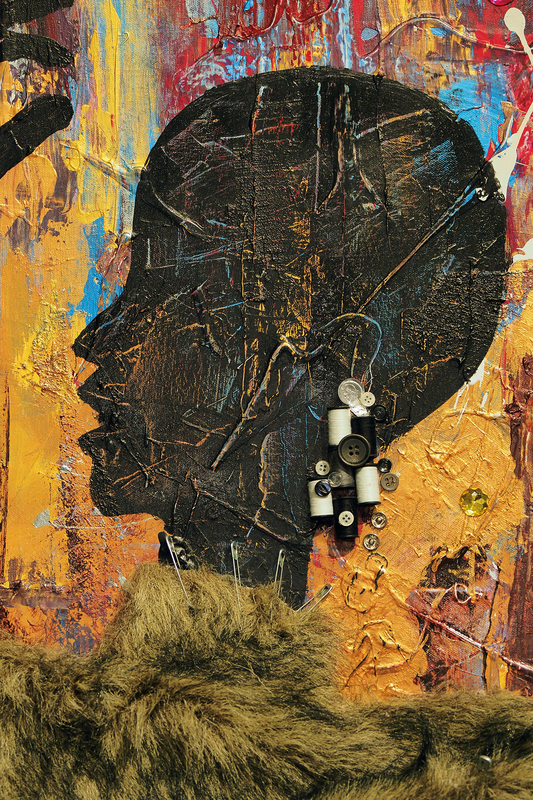 The combination of different art forms would create a synergistic effect. The first project, “Art and Fashion: A Charity Event,” was held in the Big City shopping center in Hsin­chu, with Mario as the organizer and director. “I was hoping to build a platform for interactions.” The carnival-like commercial exhibition proved very popular. The second event, held half a year later, even attracted designers from a variety of industries in the Philippines to make a special trip to Taiwan to set up stalls and sell their wares. “We are currently preparing for the next event, which we anticipate will be held in April.” Mario is planning to use workshops or NGO events to bring together resources and expand in scale. Since acquiring his street-artist license, Mario has always performed with only the most basic of props. 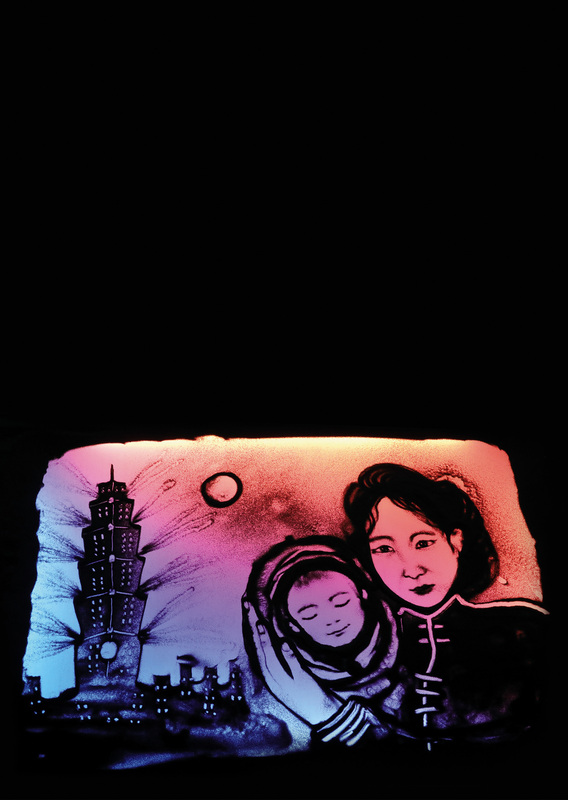 “This lightbox was made by my father for Mario,” says his wife and main behind-the-scenes supporter Chen Xinyu (a.k.a. Samentha). “For the last three-plus years, it has gone with us everywhere.” Chen, who comes from a Hakka family in Hsin­chu, was willing to convert her full-time job into a part-time one in order to play the role of “good wife and helpmate.” Besides running the household, she is also responsible for a variety of other tasks including com­munica­tion and coordination with the outside world, Chinese translation, scriptwriting, and performance content. “These days I’m very busy, but in a happy way,” says Chen. How beautiful life is when one is turning one’s dreams into reality! Mario not only performs in Taiwan, he was invited to participate in the TaiwanFest held in Canada in August of 2018. “Sand art is not very widely known in Taiwan.” Mario’s desire at the present moment is to stay in Taiwan and promote this art form. 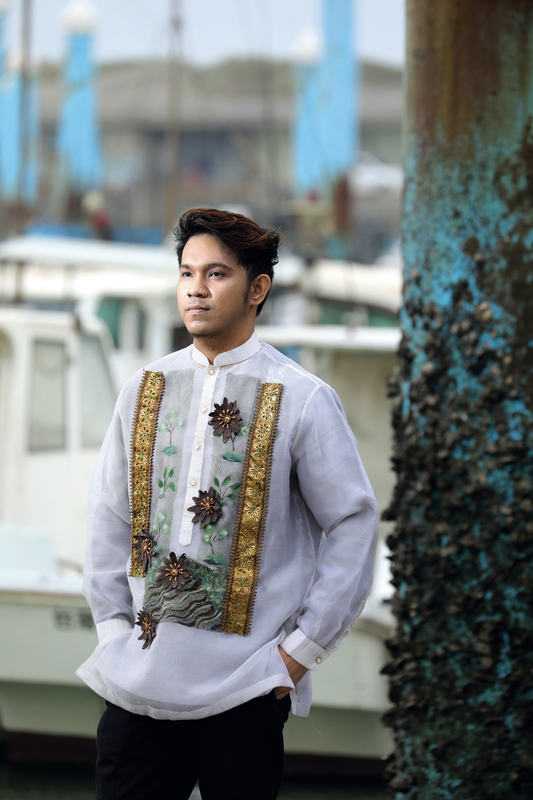 He hopes that through demonstrations, events, and stage performances he can help migrant workers increase their incomes, and also enable Taiwanese to become more familiar with the culture and unique aspects of the Philippines. “All we expect is equal treatment.” Respect for cultural diversity also allows various ethnic groups to see the friendliness and beauty of Taiwan. In the world of sand art, where there can be countless transformations in an instant, Mario has brushed away the shadows of destiny and taken the high road to happiness in life.